This very fine detailed drawing was done on Scratch Board. Nearly every hair is clearly visible. Even the wood grains, broom straw and rug texture show considerable refinement. The warm tint is due to the rather old age of the original, which was once white. The reproductions are tinted to match and printed in very high resolution to maintain the razor-sharp detail. Cats have been part of human history for so long, it's almost impossible to say for sure when they first met us ages ago. These now very familiar creatures are so common that it is almost expected to see them just about anywhere we go. Even in some business establishments they can be found contentedly sleeping in store windows, countertops or any number of places they might choose to loaf in or occupy some part of our lives. 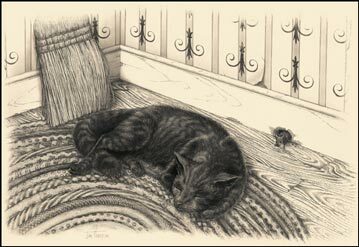 This is a depiction of a relaxed feline in a favorite corner of what might be a common household, taking up space in what to a nervous and cautious mouse is a very inconvenient spot. Akin to the Tom and Jerry cartoon theme, this mouse might be surveying the situation in hopes of slipping out to steal a bite of food which may be left unattended in the kitchen. One can only guess what might happen if this now serene guardian of the mouse hole should be disturbed or suddenly awakened. The chase would surely be on and another chapter in that old cat and mouse game would be entered for posterity. This amusing checks and balances act of Mother Nature is just one of so many that we may witness in daily life and our imaginations can tell the rest of the story.